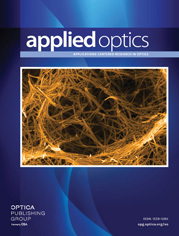 The authors are with the School of Engineering, Coherent and Electro-Optics Research Group, Liverpool John Moores University, James Parsons Building, Room 114, Byrom Street, Liverpool L3 3AF, United Kingdom. A novel technique called a two-dimensional digital phase-locked loop (DPLL) for fringe pattern demodulation is presented. This algorithm is more suitable for demodulation of fringe patterns with varying phase in two directions than the existing DPLL techniques that assume that the phase of the fringe patterns varies only in one direction. The two-dimensional DPLL technique assumes that the phase of a fringe pattern is continuous in both directions and takes advantage of the phase continuity; consequently, the algorithm has better noise performance than the existing DPLL schemes. The two-dimensional DPLL algorithm is also suitable for demodulation of fringe patterns with low sampling rates, and it outperforms the Fourier fringe analysis technique in this aspect.